Made any scary career moves lately? Not like deciding to leave your accounting job and start a goat farm . . .
Or leaving your goat farm to join an accounting firm . . .
No, the true scary moves are ones you’re making without even realizing you’re making them. They’re the ones getting in the way of your continued success and growth. 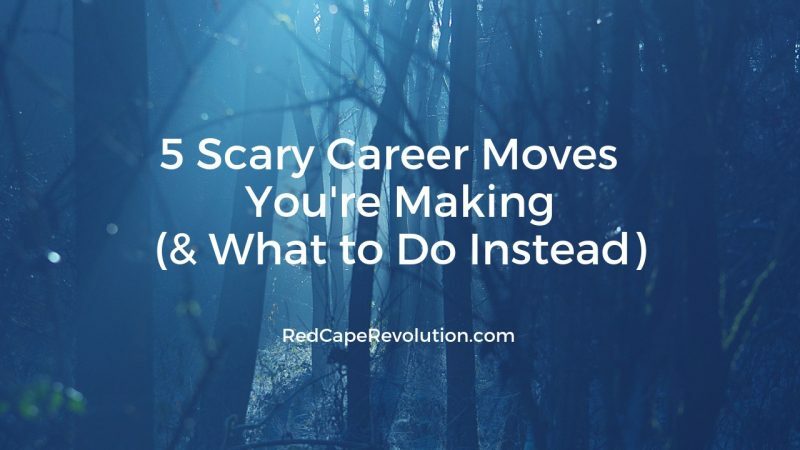 Here are the five scary career moves I see smart professionals like you making most often, along with suggestions on what to do instead. Scary Move #1: Assuming your good work will be rewarded. Don’t hide behind the outdated belief that your work will speak for itself. Truth is, when you’re doing your great work, it’s likely no one’s thinking about you. You’re not a problem to be solved. You’re not causing any pain to the organization. Which is great, except that it’s easy to be taken for granted. To become part of the wallpaper. Most of your colleagues and leaders are just too busy and focused on their own challenges to really pay close attention to all the value you’re bringing. It’s not that they don’t want to, or that they’re mean or intentionally ignoring you. It’s just that it takes time and focus. So if you want your work to be acknowledged and rewarded, you have to create the time and focus. You have to learn how to speak for the work, connecting the dots for others about why what you do makes a difference. Learning how to talk about your work–how to brag, even–is a good first step. More tips in my video here. Scary Move #2: Working harder and longer when you’re not growing as fast as you want. I used to think the best way to grow was to continually move up in my organization. After all, that’s what successful people do, right? I worked more hours. Took on more projects. Lost more sleep, gained more weight. Sure, I moved “up.” But somehow, “up” didn’t really deliver what I wanted. It was time to get clear on who I was NOW and what I wanted in my life at work. It wasn’t easy. I struggled for too long. Investing the time and energy in getting clear about who you are and what you want helps you focus your work on what matters most to you. (I’ve created videos like this and courses like this so you don’t struggle like I did). Scary Move #3: Assuming your company and your role are secure. Raise your hand if you know a friend or a colleague who worked for a big-name, successful company—and unexpectedly lost their job. If we haven’t learned the lesson by now, let’s reinforce it: even successful, money-making companies are constantly changing their talent mix. And when the talent mix needs to change, you could be next. Technology keeps changing (and can outdate your most profitable product) . . . The world keeps connecting (and an overseas organization you never heard of could buy your company) . . .
People keep being people (and one person’s ethical slipup can bring down your stock value or entire leadership team). Don’t cede control of your career. If what you have is great, love it and appreciate it, but don’t count on it forever. Here’s a gentle push to those of you whose LinkedIn profile doesn’t have a photo, includes skimpy info or doesn’t have many connections. You’re sending the message that you’re outdated, and out-of-the-loop. You may as well be wearing plaid bell bottoms. Even if you’re comfortable in your current career, anyone new you meet professionally is looking you up and shaping an opinion about you based on what’s online about you. Since you never know when you’ll need your network to help you find a new resource, data point, or job, spend 15-20 minutes now getting your profile in better shape. At least add a photo, please. You’re cuter than you think. Looking back, the biggest regret I have about making a change in my life at work is that I wasn’t brave enough to do it sooner. If I’m honest with myself, I knew I needed to take fresh steps, but held on to too many scary thoughts and avoided making a decision. Truth is, I’d love that time back now. But I won’t get that wish. The best time to explore what’s next is now. Want help? It’d be my honor to learn more about what’s happening for you and see how I can help. Schedule your free coaching consultation with me now.